VISIT OUR SHOWROOM OR CALL TODAY! Fax a rough Layout and talk to our educated Project Managers. We'll be happy to give you a bid. Remnant Yard on Site. Select and pick up a piece for your smaller project. Great Pricing! Water Jet Services NOW Available! Conveniently located in San Diego's North County with the power to serve you Efficiently and Professionally, whether you're 5 or 125 miles away. American Marble - Delivering a Perfect 10! 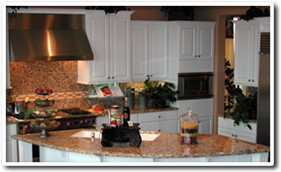 With over 50 years of experience, American Marble is the preeminent choice in residential and commercial fabrication and installation of Natural Stone, Quartz products and Solid Surfaces. We are proud to provide superior quality work and excellent service in San Diego County and beyond. Our work can be seen from San Diego and Los Angeles, to San Francisco and Las Vegas. Combining Natural Stone - nature's unique art, and man's creativity with our 50,000 square foot state-of-the-art fabrication facility puts American Marble on the cutting edge of today's demand for versatility, top quality design and luxury. Our clients are among San Diego's Finest; from Developers and Home Builders to Residential Home Owners and Interior Design firms. Rest assured there is no project too big or too small for our Project Management team; be it large scale commercial or a more intimate residential kitchen or bath. We invite you to partner with American Marble and discover the endless opportunities to beautify your project. Quality and Pride of ownership are our benchmarks. QUALITY, SERVICE & INTEGRITY since 1986!